Although my Dad passed away in 2002, a few years ago my mother gave my sister and I a lovely gift that used to belong to him. My Dad's wedding ring was very wide, with unusual carved edges. 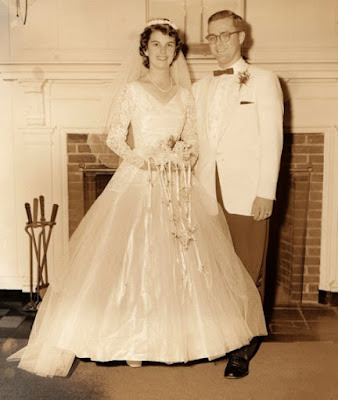 My mother had a jeweler take my Dad's wedding ring and cut it in half lengthwise, and he shaped it into two hearts for her daughters to wear on chains. It was a very precious gift from my Mom, and from my Dad. I recognized it as being from Dad's ring as soon as I saw it. I wear this around my neck often, and especially for every Valentine's Day, and it always makes me think of my Dad. Do you have any vintage jewelry from family or ancestors that you have "re-purposed" or "updated" for modern wear? Leave a comment below! My parents wedding in 1958. Can you see the ring? Heather Wilkinson Rojo, "A Valentine from my Dad, through my Mom", Nutfield Genealogy, posted February 14, 2018, ( https://nutfieldgenealogy.blogspot.com/2018/02/a-valentine-from-my-dad-through-my-mom.html: accessed [access date]). What a lovely idea and a way to keep Dad close to your heart. What a lovely gift! I'm sure you treasure it. A Traitor in my Family Tree?